The 2016 Kia Cadenza is a full-size luxury sedan that confirms Kia is a major contender. If you want to be pampered by an elegant ride, see the new Kia Cadenza at Cumberland Kia, where you always get more car for less money. The 2016 Cadenza is a perfect example of a premium vehicle that competes with the much more expensive European luxury cars, and crushes it! Web pages, videos and brochures are fun to browse, but you will not get a sense of the new Cadenza's comfort and opulence unless you test-drive one today. We are located at 1560 Interstate Dr in Cookeville, TN, and we have all the latest 2016 Cadenza models ready for your approval. Centrally located to Lebanon, Crossville, Mcminville, Franklin, and Chattanooga, Cumberland Kia is one of the most respected Kia dealerships in TN, and we cannot wait to meet you! The 2016 Kia Cadenza is both sporty and dignified. The sportiness comes from an athletic stance and race-inspired proportions. The hood is very long and pronounced, and the backside is truncated for an aggressive profile. Speaking of which, the side view of the new Cadenza is like poetry in motion: sweeping stretches of fluid sheetmetal along the sides feature futuristic creases that connect to the taillights. The dignity stems from the new hood, which is distinctly contoured in its elongated design. Heads will turn, eyebrows will rise. Even the snobby valet parking attendants will be impressed. At first glance, the 2016 Cadenza looks like a pricey European sedan with a deluxe trim package; upon closer inspection, it looks even better! One test-drive will show you how swift and responsive the Cadenza is, which you may find surprising for a car its size. It will remind you how empowering to feels to pilot a large, front-wheel-drive luxury sedan. No doubt about it, the Kia Cadenza is a rewarding ride. The powerful 3.3L V6 engine provides an awesome 293 hp and 255 pound-feet of torque, more than enough oomph to keep you on the fast track. It is actually a next-generation all-aluminum engine which boasts direct injection, a timing chain, and three-stage variable injection, which also happens to be super-quiet. The gears shift seamlessly, and the Cadenza can accelerate like a shot. Best of all, you get steering wheel-mounted paddle shifters, and a manual switch on the console to let you control the gears. Where the 2016 Kia Cadenza really shines is in the corners. It is said that car races are won in the corners, and that the measure of high-performance is how a car handles curves. You can corner hard in the Cadenza, with more control and tighter steering than you usually find in a full-size sedan, and you may find yourself scouring the landscape for hairpin turns and twisting canyon roads. Don't be afraid to put the Cadenza through its paces, and rest assured that its solid brakes are commanding and confident. 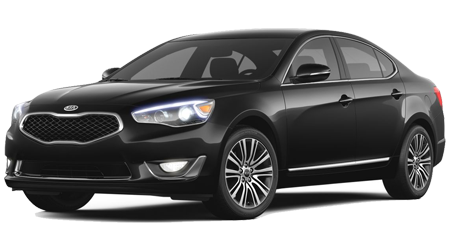 There is a large selection of 2016 Kia Cadenzas now in stock at Cumberland Kia, and we urge you to take one for a spin. If you find a truly opulent sedan that performs as well as a $60,000 European car with limousine-quality amenities fit for a king, but costs about half as much, why wouldn't you be interested? When you are ready to step up to true elegance, we'll be waiting for you at 1560 Interstate Dr in Cookeville, TN, with the keys to a Kia Cadenza. We serve a wide area of Northern TN, including Lebanon, Crossville, Mcminville, Franklin, and Chattanooga, so everyone is invited to test-drive the exciting new Kia Cadenza.